TUCSON, Ariz. - There is a lot happening around Kolb and Valencia. There's a major road project there, and just down the road -- Amazon is building a huge new warehouse. 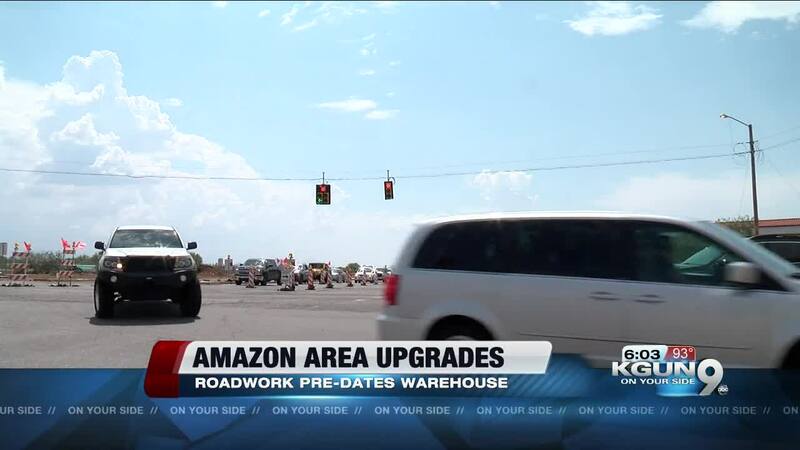 The road work was planned long before Amazon entered the picture but it should help ease congestion when 1500 Amazon employees start coming to work. Things are happening fast at the construction site for the big new Amazon warehouse. But a lot of other things are happening around there to help the area cope with the impact of the people and the commercial traffic there. Amazon says it will have about 1500 employees at the warehouse on Kolb between Valencia and I-10. But a major expansion at Kolb and Valencia should be complete about a year from now---right about the time Amazon is projected to open. The work was planned long before the warehouse ---12 years before---as part of the regional transportation plan. Sam Credio is interim Deputy Director at Tucson’s Department of Transportation. He says, “That is one of the most heavily traveled roadways in our region, obviously, not only for commuters on their daily commute, but many of us on the east side, use that intersection to get to the airport. So definitely a lot of traffic in that intersection, specifically, at Valencia and Kolb and much needed improvements." The intersection already carries about 60 thousand cars a day. The project will expand Valencia to six lanes in all directions. To help traffic flow faster, left turn lanes will be placed away from the main intersection. Tucson Electric figures the big warehouse will create eighty times the demand of an average house. But TEP says it grows its system to help grow the local economy. Joe Salkowski of Tucson Electric says, “We think about generating capacity, substations, circuits, making sure we've got all of the facilities in place to serve new customers like Amazon or other large employers without compromising the reliability of our service to other customers." And TEP says as part of TEP's economic development incentive program Amazon will get discounted rates for its first few years.